Veteran cornerback Rashean Mathis is happy to take rookie Alex Carter under his wing and show him the ropes, much like he did with Darius Slay. Rashean Mathis has known new rookie cornerback Alex Carter going on 10 years now. Alex Carter’s father, Tom Carter, played in the league for 12 years and remained an advocate for the players union after his playing days were over. Mathis was a player rep in Jacksonville and Tom Carter would come down to Jacksonville every year and accompany Mathis on union trips. The two have remained friends ever since. The first time Mathis met Alex Carter was at the Carter household in St. Augustine before a round of golf in 2005. Because of his friendship with Tom Carter, Mathis followed Alex’s progress through high school and at Stanford. During Day 2 of the NFL Draft on May 1, Mathis had fallen asleep during the third round and didn’t see the Lions pick Alex Carter live. Mathis and Tom Carter spent the next 15 minutes on the phone and then Mathis sent Alex Carter a text a couple minutes later congratulating him on being selected by Detroit and telling him that if he needed anything at all to call or text. If Carter is smart, he’ll take Mathis up on his offer. Mathis has been terrific both on and off the field for Detroit since coming over from Jacksonville before the 2013 season. He’s started the last two seasons and was graded the 12th best cornerback in the NFL last year by Pro Football Focus. Mathis has played a huge role in mentoring Darius Slay through his first two years in the NFL. Mathis made it his duty to take Slay under his wing and show him the ropes both on and off the field. The two have since built a close friendship and Slay has credited Mathis with helping him go from an inconsistent rookie in year one to one of the top young cornerbacks in the league in year two. It's Mathis' plan to be the same kind of mentor for Alex Carter. Mathis re-signed with the Lions for two more years this offseason, but at age 34, he knows Alex Carter could eventually be his replacement. That won’t stop him from passing on any knowledge to the youngster, however. It’s something he learned early on in his career in Jacksonville when veterans Donovin Darius and Marlon McCree took him in and showed him the way when he first entered the league. Alex Carter appears to be the kind of player who will try to soak up as much info from the veterans as possible. “You can’t come in saying you’re going to be a starter right now,” Carter said during rookie minicamp. “You have to work at the little things. You’ve got guys that are 30-years-old that have to feed their family too. “You have to come in work on special teams first and foremost. Show the coaches you’re going to give your effort 100 percent. Do that and then just keep learning the defense as you go. Then work into the rotation. Veteran players like Jason Jones, Glover Quin, Haloti Ngata and Manny Ramirez all have a similar philosophy as Mathis when it comes to being veteran leaders. That’s huge for young players in this league and it’s not like that in every locker room, according to Mathis. Alex Carter and the rest of the Lions rookies would be wise to take advantage of the culture in Detroit's locker room. I love this attitude Mathis brings to the game. Some vets don't want to help rookies take their job but Mathis knows he has tons of knowledge to pass on and wants to help the team. Probably one of the best FA signings we've made over the past several years, a solid contributor on and off the field. It'd be great if Carter is ready to step in next to Slay by next year and we can FINALLY have the young CB duo we've needed for years. But for now, I'm more than happy to have Mathis on the field and on our team. DETROIT -- Sam Martin kicked off 75 times last season. He also attempted 73 punts. Overall, it was a quality campaign for the second-year punter out of Appalachian State, but all anyone is likely to remember is his final boot, a 10-yard shank in the fourth quarter of the Detroit Lions' 24-20 playoff loss to the Dallas Cowboys. The errant effort gave the Cowboys excellent field position with a little more than eight minutes to go in the contest. 11 plays later, Dallas punched it into the end zone for what proved to be the game-winning score. 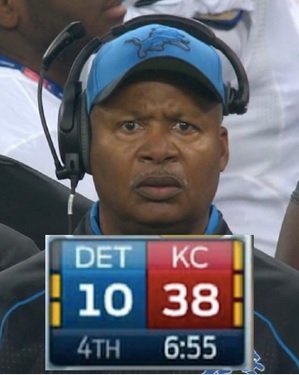 Martin was not the sole reason the Lions lost. Far from it. That blame is shared among other players, coaching decisions and officiating blunders. But the young punter didn't stick around after the game to offer his account of what happened on the mishit. More than four months later, at the team's Taste of the Lions event at Ford Field, Martin explains how his indecisiveness in that critical moment led to the physical error. "It was a confusing call," Martin said. "First we were pooch punting, then we had a delay of game and got pushed back. It was a borderline pooch-punt or full-punt range. I wasn't sure what I was going to go. The ball came and I hadn't decided yet. I took my steps to do one thing and did my drop to do another. I've never done that in my life. A bunch of things went wrong at one time." Martin has moved on from the blunder. It's not like he has another option. He knows there's nothing to be gained by carrying the anguish and frustration of that moment into next season. "You mess up and that's not acceptable, but you acknowledge it and move past it," Martin said. "I've got a couple months before I'm going to be punting against the San Diego Chargers and I can't be thinking about a punt that happened in January." Looking back at last season as a whole, Martin is pleased with his progress, even though he fell short of his individual goal of being the league's top punter. "I think I improved a lot from the year before," he said. "My stats from the year before were better, but situationally, I feel I was a better punter and definitely a better kickoff guy." Martin ranked in the top 10 in both net average and punts downed inside the 20-yard line. His biggest strides came on kickoffs where better than 70 percent of his attempts resulted in a touchback. Only Carolina's Graham Gano and Indianapolis' Pat McAfee were better. That is not the first time Sam Martin has choked. I don't trust him in the 4th quarter and I think he has performance anxiety. The media is treating that Sam Martin story as if it was new but he came out in February and said the same thing. A few weeks removed from the NFL draft, the Detroit Lions finally filled out the team's 90-man offseason roster with a series of signings last week. It goes without saying, but the roster is very fluid this time of year. We're likely to see a few more changes before training camp gets underway in two months. Still, it seems like a good time to check in on the team's current salary cap situation. In the past two weeks, the Lions have signed wide receivers Lance Moore and Greg Salas, defensive lineman Corey Wootton and cornerback Chris Owens. Detroit also restructured the contract of safety Glover Quin, freeing up more than $2 million in cap space for the upcoming year. There's still one lingering item on the agenda, the signing of first-round draft pick Laken Tomlinson. Given the simplification of rookie contracts in the current collective bargaining agreement, the standard four-year deal should be completed any day. While we still don't know the exact number for Tomlinson's 2015 cap hit, it can be reasonably estimated. Factoring in that projection, the Lions currently have around $3 million in cap space remaining. You can view our full chart here. It must be noted, only the top 51 contracts count against the cap during the offseason. Once the regular season begins, all 53 players, plus any on injured reserve and the practice squad, will count against the cap. Therefore, it benefits a team to have a small buffer. Any unused space will carry over to next year. Here are a few additional observations from the team's recent acquisitions. -- Guard Manny Ramirez, acquired in a draft-day trade, is going to count $3 million against the cap this season. His contract calls for a $1.4 million base salary and up to $1.6 million in playing-time bonuses. Those bonuses are considered "likely to be earned" based solely on his playing time in Denver last season. If he ends up a reserve in Detroit and doesn't meet the escalators, the cap space will be credited to the Lions next offseason. -- Wootton received a veteran minimum one-year deal, which includes a maximum $80,000 signing bonus to quality for the veteran minimum salary benefit. The team also guaranteed $70,000 of the lineman's base salary. While $150,000 is approximately 0.1 percent of the total cap, it's fair to read into the added investment as an increased likelihood of Wootton making the team's final roster. Phillip Hunt, another free agent defensive end signed this offseason, received no guaranteed money. -- Moore also got a veteran minimum contract, with a $40,000 signing bonus. According to the Detroit Free Press, the former Saints and Steelers wide receiver is in line to earn another $40,000 bonus if he is on the roster for Week 1. What the deal amounts to is a low-cost, offseason trial period to see if Moore can offer the offense greater production than the team's other slot options, namely Jeremy Ross and Ryan Broyles. Parting ways with Broyles would save the Lions' nearly $900,000 in 2015, while Ross is set to cost the team $660,000. -- Owens and Salas received no guaranteed money. It's not just receivers the Detroit Lions are working out Tuesday. They're bringing in a couple running backs, too. Running backs Ben Tate and Daniel Thomas visiting the Lions today, joining receivers Robert Meachem and Brad Smith. The Tate visit was first reported by ESPN, while National Football Post reported Thomas' workout. Tate played in 11 games for the Minnesota Vikings and Cleveland Browns last year, starting six games for the Browns and rushing for 371 yards and four touchdowns. Thomas spent the last four seasons with the Miami Dolphins and rushed for 168 yards in 12 games as a backup last year. The Lions appear set at running back after drafting Ameer Abdullah in the second round and with leading rusher Joique Bell and backup Theo Riddick returning. Bell is not participating in workouts this spring as he recovers from knee and Achilles clean-up surgeries, but he and Abdullah are expected to split carries for he Lions this fall. Bell ran for a career-high 860 yards in 15 games last year. Tate, 26, played his first three seasons with the Houston Texans and ran for a career-high 942 yards as a rookie in 2011. Seems to be mostly due dilligence but can someone please explain to me why I'm supposed to give a poop about who the first person to report something is/was? I don't care. Stroke your ego in private, not in my face. It's giving credit where credit is due. In reporting and media, being the first to report/break a story is a big deal, so it's a common courtesy/best practice to acknowledge that. If you want a comparison, think of it like providing references in a paper. If you use something someone else has already written, you have to give reference to it or you're guilty of plagiarism. Same idea but with reporting. ESPN insider article ranking all 32 rosters. We got 7th behind some pretty good teams. Analysis: The Lions have done a really good job of upgrading their roster the past few seasons. Elite talents like Johnson remain, but they have been augmented by a steady influx of talent on both sides of the ball: Wide receiver Tate, free safety Quin, defensive end Ansah and guard Warford. As a result, the Lions have a roster with few holes, even after the departure of Ndamukong Suh in free agency. They nearly won a close, controversial playoff game last season, and it won't take much of an improvement for Detroit to be a real contender in 2015. Exactly. It's also why the beat reporters are not crazy about the Lions' in-house reporters (Twentyman and O'Hara)--the idea of them, not the people themselves. For some reason (I can't imagine why), they get most of the "scoops." Thanks, that explains it pretty well.